An increasingly popular yet age-old art form, Japanese woodblock printing (mokuhanga) is embraced for its non-toxic character, use of handmade materials, and easy integration with other printmaking techniques. In this comprehensive guide, artist and printmaker April Vollmer - one of the best known Japanese woodblock printing practitioners and instructors in the West - combines her deep knowledge of the historic printmaking practice with expert instruction and presents a collection of diverse and gorgeous prints by leading contemporary artists in the medium, as well as her own work. At once practical and inspirational, this handbook is as useful to serious printmakers and artists as it is to creative types who are drawn to Japanese history and aesthetics and are looking to experiment in other media. "Vollmer's comprehensive guide to traditional tools and materials (including an enlightening discussion of Japanese paper), and lucid, illustrated, step-by-step instructions on all aspects of cutting a block and pulling a print make this publication a uniquely invaluable manual and guide. Artists, curators, collectors, gallerists, and Asian art enthusiasts will find this remarkable book indispensible." 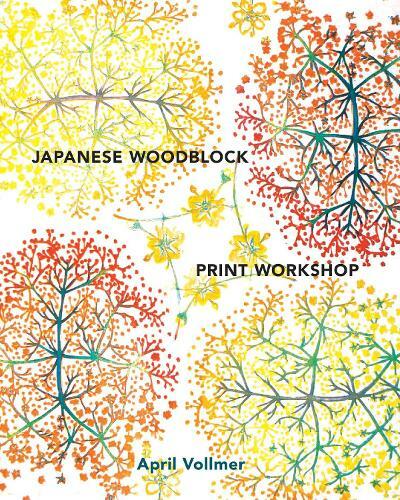 "While coalescing a mass of cross-cultural, on-site know-how and vast swaths of creative inspiration from traditionally trained artisans to dynamic contemporary artists, Japanese Woodblock Print Workshop elucidates anew the multilayered world of mokuhanga." "This is an exemplary, beautiful book with an expansive viewpoint that brings together a clear explanation of the technique with a broad view of its influence, illustrated with work from a wide circle of international contemporary artists, giving its inherent beauty fresh relevance."